Corsair has announced the worldwide availability of the Graphite Series mid-tower computer case – aiming the Graphite Series 600T chassis squarely at gamers. The Corsair Graphite Series 600T case was first shown off at Computex this year, and is now available to buy for just under £100. 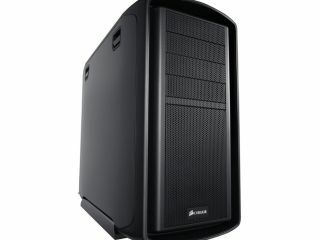 The case features dual 200mm fans, eight PCI-E expansion slots and some room for the air to circulate and keep things cool. "The Graphite Series 600T incorporates many of the same builder-friendly features from the award-winning Obsidian Series 700D and 800D, including advanced cable management and a large backplate cutout for easy CPU cooler installation, explains Corsair. "It is designed to accommodate years of future component upgrades, with a USB 3.0 front panel connector and heavy duty latches and panels."